1Note: Australopithecus and Paranthropus make up a "Subfamily" called Australopithecinae, more commonly known as Australopithecines. The genus Homo is in the "subfamily" called Homininae, more commonly known as Hominine. An * marks groups known only through fossils. 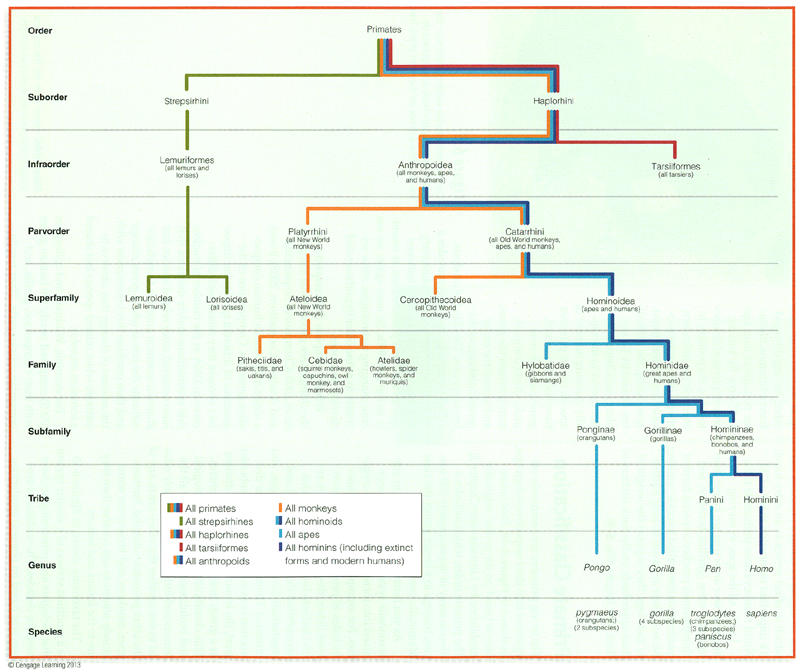 Primate taxonomic classification. This abbreviated taxonomy illustrates how primates are grouoped into increasingly specific categories. Only the more general categories are shown, except for the great apes and humans. (Compare with figure below.). (*in captivity) >30 yrs. (? )* >55 yrs. * >50 yrs. (?) >50 yrs. 75 yrs. Sources: Bernard G. Campbell and James D. Loy, Humankind Emerging, 8th ed., Boston: Allyn and Bacon, 2000, pp. 121, 98, 106, 162; Ruth Moore, et al. Evolution. New York: Time-Life Books, 1964, p. 185; John E. Pfeiffer, The Emergence of Humankind, 4th ed., NY: Harper & Row, 1985, p. 194. 1. As a group the apes have been the subject of much mythology and many misconceptions. “Dental Apes” appeared first, in the Oligocene, ca. 33 mya1. Dental apes are “apes” with monkey-like bodies who did not hang or swing. These include Apidium and Aegyptopithecus. 204-206 3. True apes probably originated in the early Miocene period, ca. 20 to 17 mya. 204-206 Apes flourished in the later part of the Miocene, 15 to 5 mya. a. They vary physically--differing in size, for example, from the relatively small gibbon with little sexual dimorphism to the huge gorilla with considerable sexual dimorphism. 150-160 b. They vary behaviorally--their social structure, for example, includes both the territorial, closed groups of the gibbon and the free-ranging, open groups of the chimpanzee. 213, 432 i. Feet become more foot-like. 425-427 ii. Leg bones are much stouter and have more pronounced dorsal ridges. 210 iii. Leg muscle structures change. 210 iiii. Humans have developed a "closed-knee stance." 213 v. Loss of some mobility and prehensility in feet. 213 i. A number of changes take place in the pelvis. Basically, with bipedalism the pelvis becomes shorter and wider, has a "distinct pelvic bowl," and the ridges where the leg muscles attach become heavier. Humans also have a deep sciatic notch. These changes will be reviewed later with the discussion of Australopithecines ("southern apes"). 138, 430 ii. External tails are lost. 212, 430 i. Spine has become more massive and rigid, with fewer vertebrae. And humans developed an S-curve backbone rather than one with a simple curve. 425, 427 ii. Chest has become wider and more barrel-like. 425, 427 iii. Shoulders have broadened. 425 iiii. Relatively longer necks developed. 425-427 i. The forelimbs of the apes have become elongated and strengthened relative to the length of the body. 429 i. The occipital condyles (the hinges on which the skull articulates with the atlas of the spine) have moved from a position far back on the occipital bone forward to an intermediary position. 215, 429 ii. The related foramen magnum (the opening through which the spinal cord passes from the cranium) has also moved forward and downward. 221 iiii. In some adult male apes the heavy chewing and neck musculature is attached to a bony ridge that forms a sharp crest along the top of the skull (sagittal crest). 426 v. Most apes have a supraorbital ridge (a marked bulge of bone across the region over the eyes). 428 vi. Modern adult humans have a cranial base flexure (bend). vii. Humans have a longer pharynx, a feature associated with human speech. 428 viii. Noses are elevated in humans, and are separated by the septum into two chambers. ix. In comparison with apes, human upper lips are relatively short; human's lips are never as thin as apes. 428 i. Humans have larger brain cases (for their larger brains), with highly developed frontal and occipital regions. Skull is more developed in the frontal and occipital (curved back and base of the skull) regions as the cerebrum (large rounded structure of the brain) becomes increasingly larger. ii. Cerebral cortex (thin layer of grey matter covering the cerebrum, also known as the neocortex) increases in area. In humans this lies in folds or convolutions over the entire surface of the cerebral hemisphere. This can often be seen in endocasts (fossilized casts of the interior of a skull). 166-172 iii. Humans have developed "association" areas (regions of the cerebrum surrounding the sensory area). 238-239 iiii. The brain weight / body weight ratio increases. 426-427 i. In apes jaws slant outward and downward (prognathism). 428-290 ii. Human's lower jaw is comparatively small, but always has a distinct chin. 217 iiii. Apes still possess conical, daggerish canines projecting well beyond the surface level of the lower teeth and overlapping them, with corresponding diastemata (singular is diastema). 215 vi. In humans the palate is arched and curves outward at back (parabolic arch). 161-165 a. Trend: multiple single births. 120 b. Longer periods of pregnancy. Longer periods of growth to adult size and status, with corresponding prolonged periods of dependence. And thus a greater dependence on flexible, learned behavior. 150-160 e. The tendency to live in social groups and the permanent association of adult males with the group. 122 f. The tendency to diurnal (daytime) activity pattern. 300-308 g. The beginnings of art and ritual. 144-148 Extinction of native habitats and poaching may mean many apes will survive only in places like zoos and laboratories.